Hi, i'm trying to find the area between these two plots, i need to find the area of each individual section where the plots overlap. For some reason my 'trapz' commands aren't working. All help would be appreciated. If more info is needed about the program just let me know and i'll see what i can do. You are using the loop incorrectly, and you don't need it anyway. You are doing an integration over a single point, which is unlikely to work in any context. 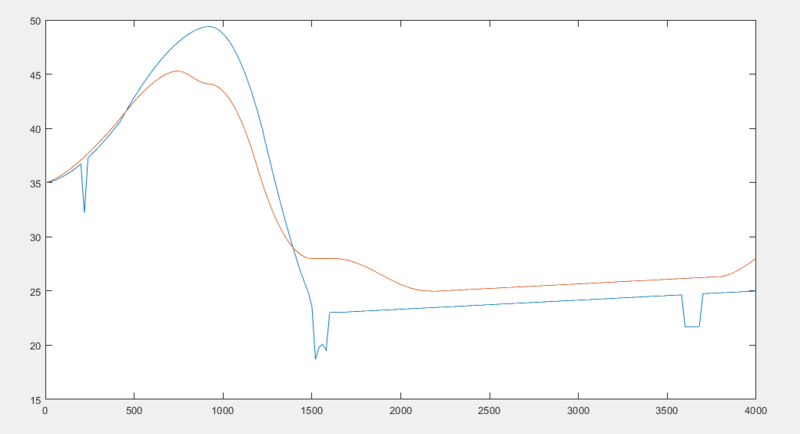 You could sum the values and divide by the delta x, but by not using array operations you're not taking advantage of the full potential of Matlab. The method I show below will have a rounding error that increases with the number of crossings, but it shouldn't get too bad, especially if you're using a finer x scale. thank you for your quick answer to my question, it seems so simple when you point it out. I'm used to coding in python, rather than matlab, which is probably why i was trying to loop through it and why i didn't use matrix manipulation (plus matrices is a topic i'm fairly new to).